It’s not a cure-all for Texas traffic, but the state’s department of transportation, TxDOT, eases two major pains with ArcGIS Pro and ArcGIS Open Data: data publishing and data requests. With ArcGIS Open Data, the public can see planned department of transportation projects, traffic volumes, and congested roadways in Dallas and throughout the state. Chris Bardash, a TxDOT GIS analyst, used ArcGIS Pro to implement a single project that can publish services for the entire organization. This allows TxDOT to easily share its data both internally and externally via ArcGIS Online and its ArcGIS Open Data site. On the whole, the solution cuts the time it takes to publish data and reduces the number of data requests that TxDOT’s data management team has to process manually. Initially, they had created a single map document for each service—that is, one map for every service—so there were approximately 40 map documents sitting in a folder. “Then we realized we could use the map tabs within ArcGIS Pro to contain all the [map documents] in a single product,” recalled Bardash. So they started by building an ArcGIS Pro project to import all the map documents. Now, there is a single ArcGIS Pro project on a network drive that anyone in the data management section of TxDOT can access. Additionally, all the data is sourced on an enterprise database, so users can just open the ArcGIS Pro project and it’s already connected to the data. By automating some manual steps, such as removing extraneous fields, ArcGIS Pro performs the quality control that has to be conducted before publishing a service. 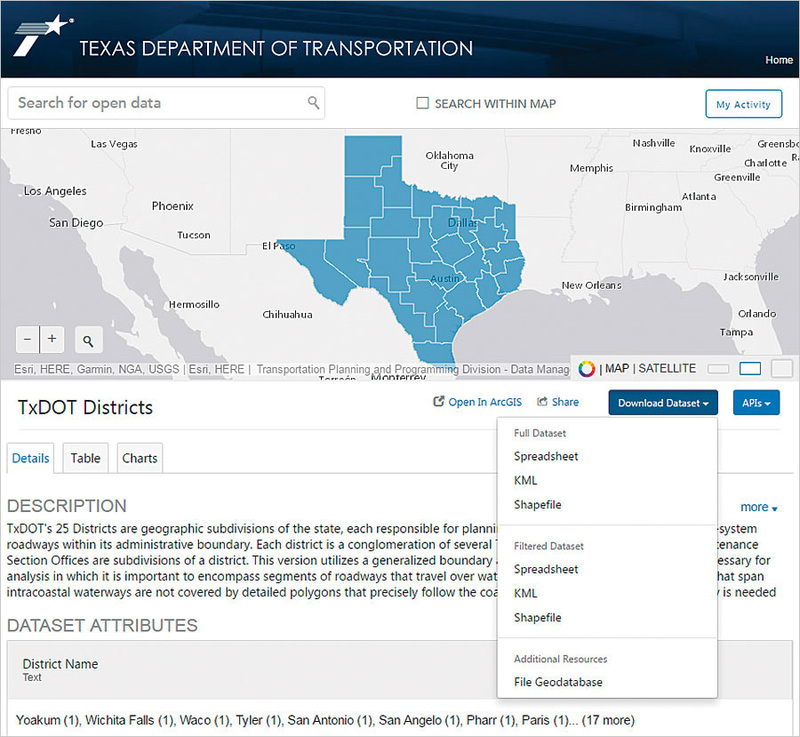 The Texas Department of Transportation (TxDOT) implemented an ArcGIS Open Data site, which anyone can use to download information on the work the department is doing. So the team wrote a Python script that can check to see if the service has any of the fields that need to be deleted. “We couldn’t write a script specific to each layer, so we wrote a script that searched for any fields in a list of about ten of them,” explained Bardash. When a user activates that ArcGIS Pro task (a set of preconfigured steps that guide someone through a workflow), the delete fields script gets triggered automatically. From there, the user overwrites the service and reviews the item details page in ArcGIS Online to make any final adjustments, such as removing underscores from the item names and changing settings, like optimizing layer drawing, that aren’t available to set when publishing. To help with transparency, TxDOT has also implemented an ArcGIS Open Data site. To reduce the time it took to handle the number of labor-intensive data requests the department received, TxDOT was looking for a solution to share data externally. 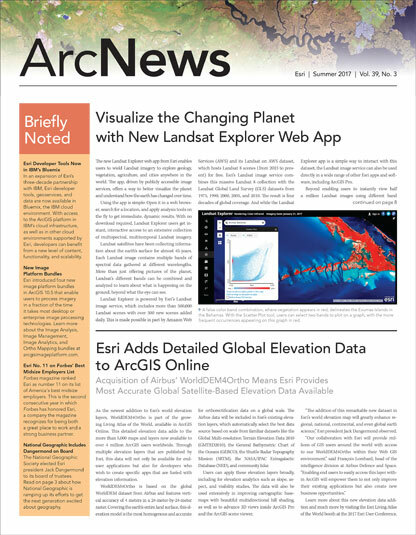 “We were preparing to build our own site when our Esri contacts informed us about the out-of-the-box ArcGIS Open Data solution available to us for free as part of our Esri account,” recalled Bardash. With very little preparation, Bardash and Breznicky were able to quickly stand up an open data site. From there, it could share the services it had already prepared and made available in ArcGIS Online. Now, if consultants working on a TxDOT project need to get ahold of official highway data to put on a map, the data management section no longer has to find the data and send the specialists a zipped geodatabase file. Instead, the team can give them a link to TxDOT’s open data portal, and the consultants can find the data themselves. Learn more about ArcGIS Pro, and find out how to implement an out-of-the-box ArcGIS Open Data site.